You are here: Home / Saving Money / Lifestyle / How Much are Aluminum Cans Worth? 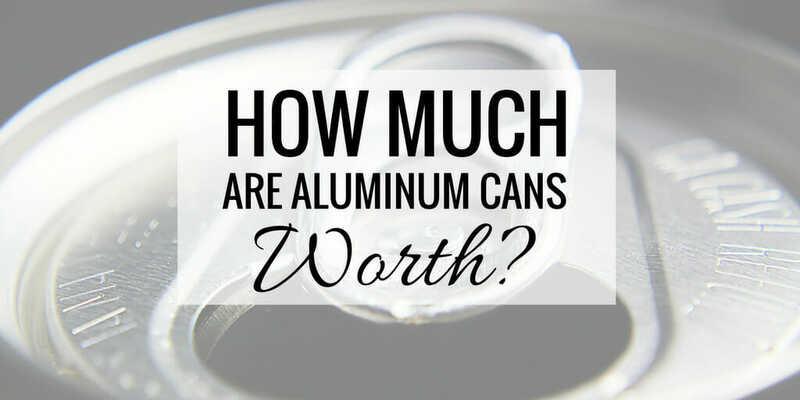 So, how much are aluminum cans worth? Depending on how many you have and the efforts you’re willing to go through, you can get anywhere from a few pennies to hundreds or thousands of dollars. You have aluminum cans and you want money. You’re in luck, because metal is always worth money. Why is Aluminum So Cheap? Due to the light weight and smaller price tag, it does not move as much as the other, more expensive metals. In fact, when compared with copper, lead, nickel, tin and zinc, it is the least expensive metal per pound. This is generally because it is also the most prevalent. As you can find aluminum in all of your cans, you are able to quickly and easily find aluminum just about anywhere. So, in order to receive much money for the aluminum can, you need to have a large amount. When trading in aluminum, feel free to crush the cans ahead of time to save space. Because the price of aluminum fluctuates so much, it’s helpful to know what a historical average is to make things easier. Over the last 30 years, the average price of aluminum has been about 81 cents per pound. The data I used came from United States Geological Survey (USGS.gov). Disappointing, I know. You need quite a few of these to take your spouse out to dinner. A single aluminum, 12 ounce can weights around half an ounce. This means, if you have a 12 pack of cans, it is going to weight about 6 ounces in aluminum. This is only about 4/10 of a pound, or in other words you are going to receive just over $0.34 for the 12 pack at 85 cents/pound. So, when you have all of this in mind, it shows you that you really need to start collecting hundreds, if not thousands of cans in order to obtain anything truly valuable (100 cans is going to net you around $2.50). We’ll discuss these in a bit more detail, but before I do, I wanted to mention an idea that might be able to net you a higher amount price with some more effort. If you look at aluminum ingots on eBay, you can see them selling for upwards of $4.00 a pound. That’s a 570% markup as of this writing! With a little ingenuity and time you can really increase the amount you earn from your cans. Below is a video detailing how to melt your cans down into ingots. Please bear in mind: you should consider the costs of your time, fuel to melt the cans and cost to ship them or else you may lose money. Additionally, molten metal is very dangerous and only an adult should do this and do so carefully. First, it is important for you to understand that the price of aluminum does fluctuate. This means every single day it can vary a bit different. It does function like stocks, as people can invest in the different precious metals, but in general you really are not going to see any sort of major moves on a day to day basis. There are some metals that do vary more significantly, such as copper, nickel and tin. These are three of the most valuable light and everyday metals. On top of this, you need to realize that when you take the aluminum in, you are not going to receive the same price that it is listed at. The scrap yard is going to have a buy price and a sell price listed. This means you are most likely going to pay a little more for the price of aluminum than what it is worth and you are going to receive less than what it’s worth. This simply is because the scrap yard needs to make money on the transaction, and this is not possible if it offers the same price as what aluminum is trading at. Now, if you live in the state of Michigan, you receive the highest payback for any sort of bottle in the country, as every single aluminum can is worth 10 cents per can return. Just remember that if you live near a state with a deposit, it is actually illegal to bring in outside cans for the higher deposits, so you cannot pull a Kramer and Newman from Seinfeld New York to Michigan aluminum can transport; as these guys found out.